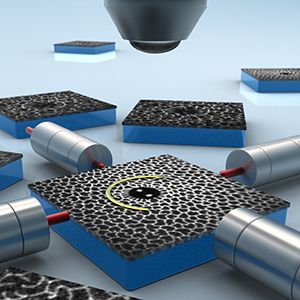 To support many of the research directions within this area, several faculty develop equipment and methods for specialized, high-resolution characterization of materials and interfaces. Israelachvili is a pioneer of the surface forces apparatus that has unparalleled force and distance resolution for characterizing interfacial mechanics. Han has developed a suite of spectroscopic methods to measure both the bulk and near-surface dynamics of complex fluids. The Chmelka lab specializes in multi-dimensional NMR measurements to characterize speciation and molecular interactions in complex materials and processes. The Gordon group works on novel combinations of imaging and spectroscopy methods to measure chemical structure and activity with high spatial resolution on a variety of materials. Helgeson develops sample environments for in situ small angle scattering measurements under complex flows and processing conditions. The Segalman lab uses a customized STM and AFM techniques to investigate thermoelectric properties of small molecules over materials at nanometer to micron length scales. Squires has developed interfacial rheometry and microtensiometry methods for measuring the mechanical properties of interfaces with unprecedented precision, and microfluidic techniques to sculpt and visualize chemical gradients in space and time. The Christopher lab develops in-situ spectroscopy and microscopy approaches for interrogating dynamic structural changes of heterogeneous catalysts under reaction conditions.